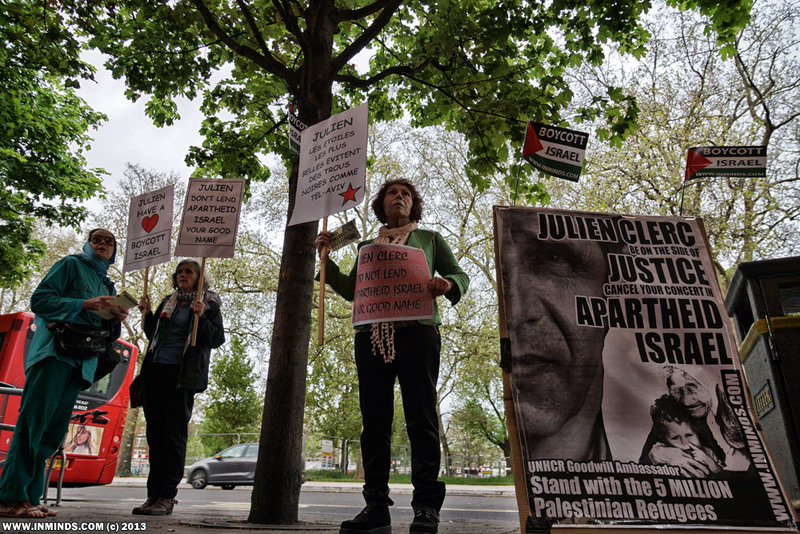 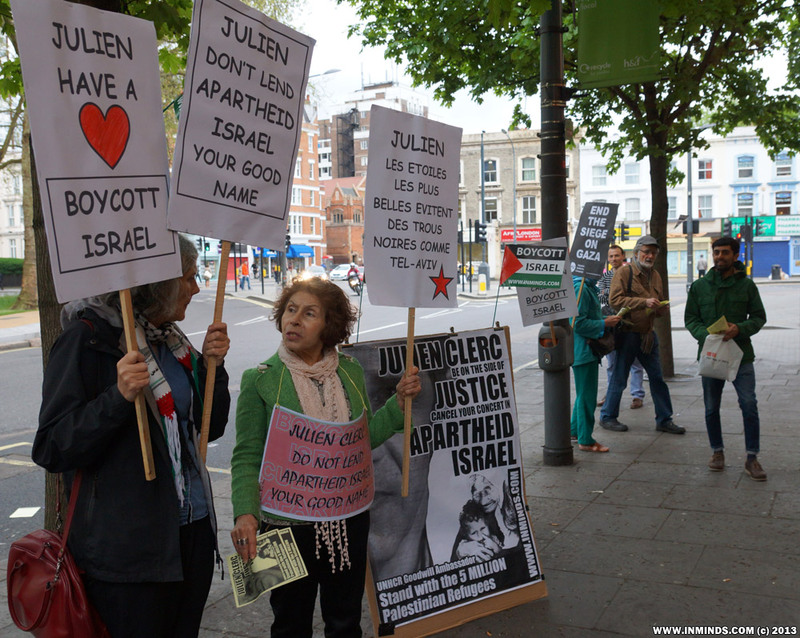 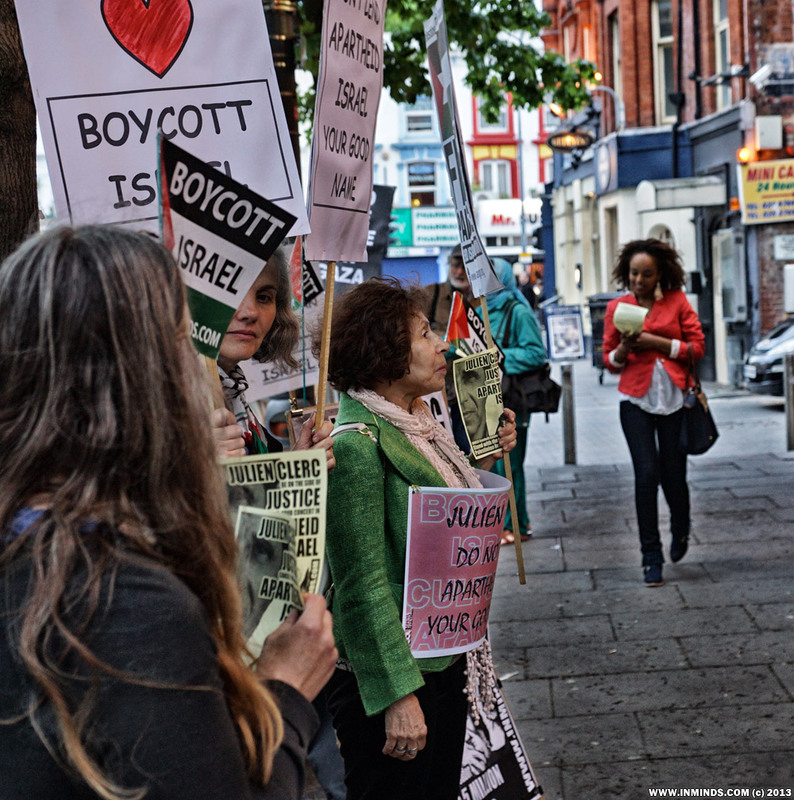 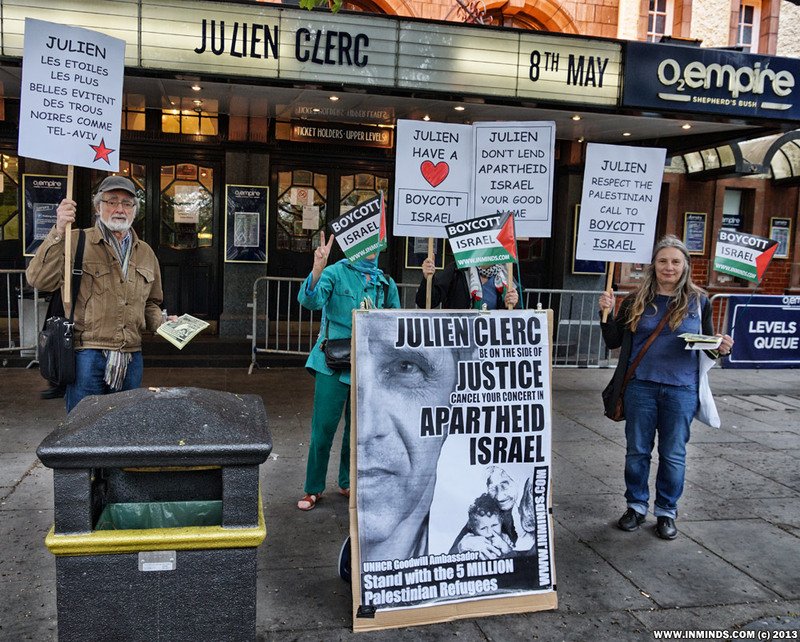 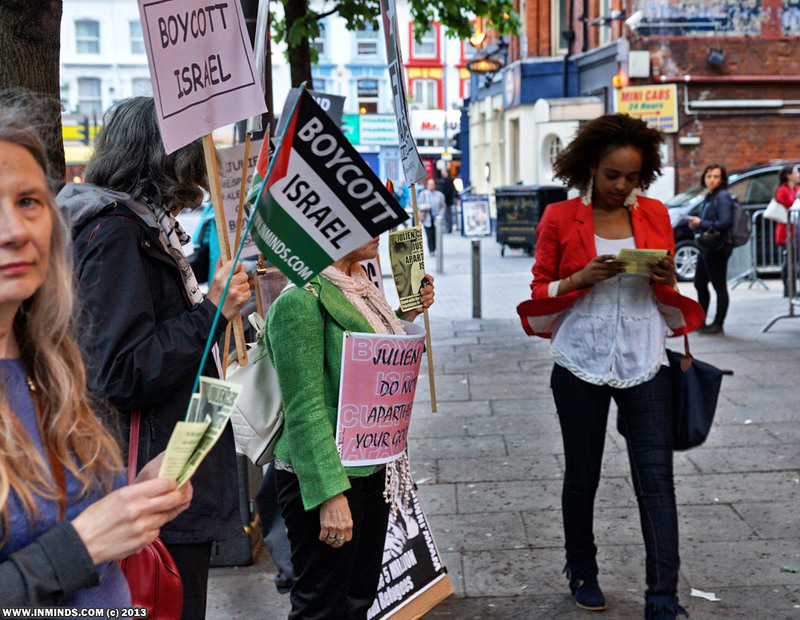 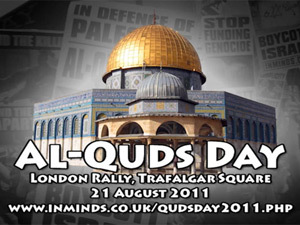 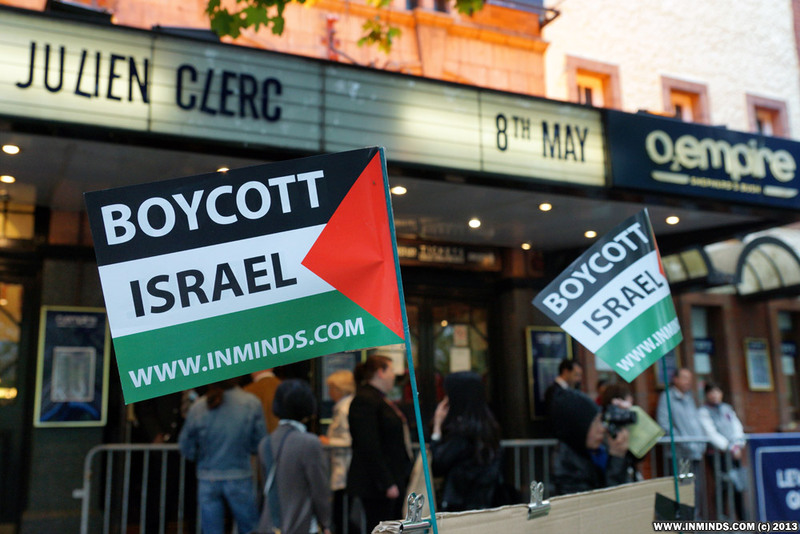 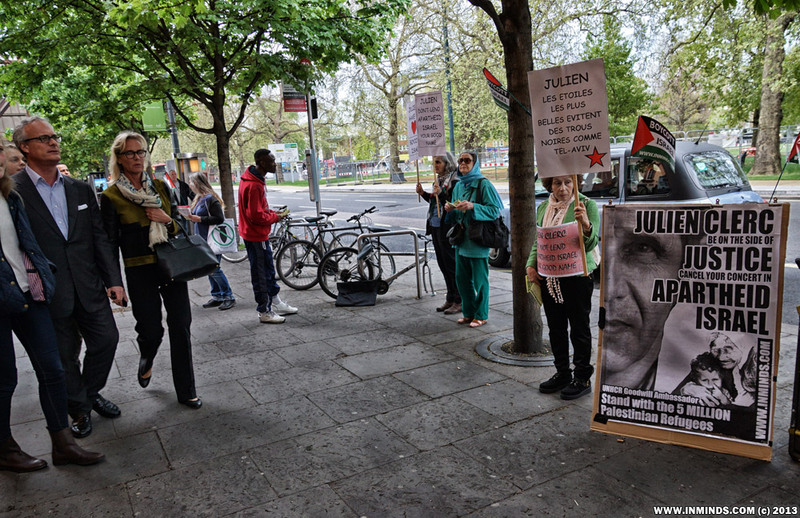 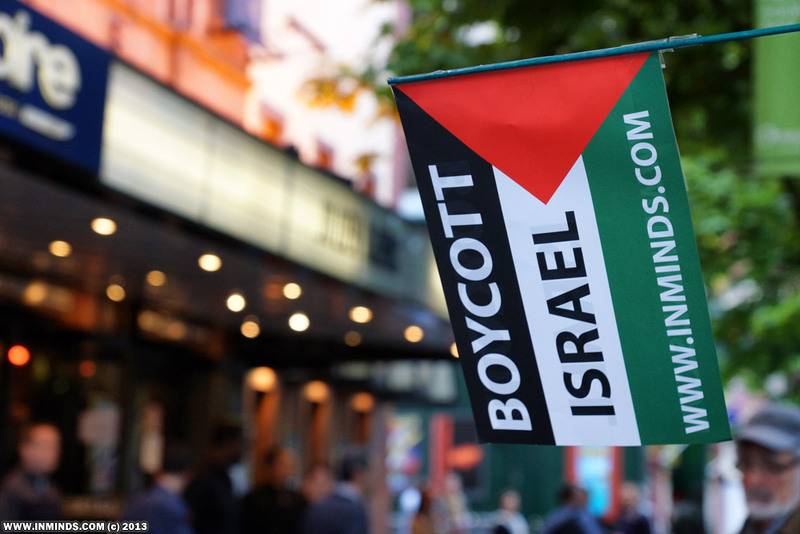 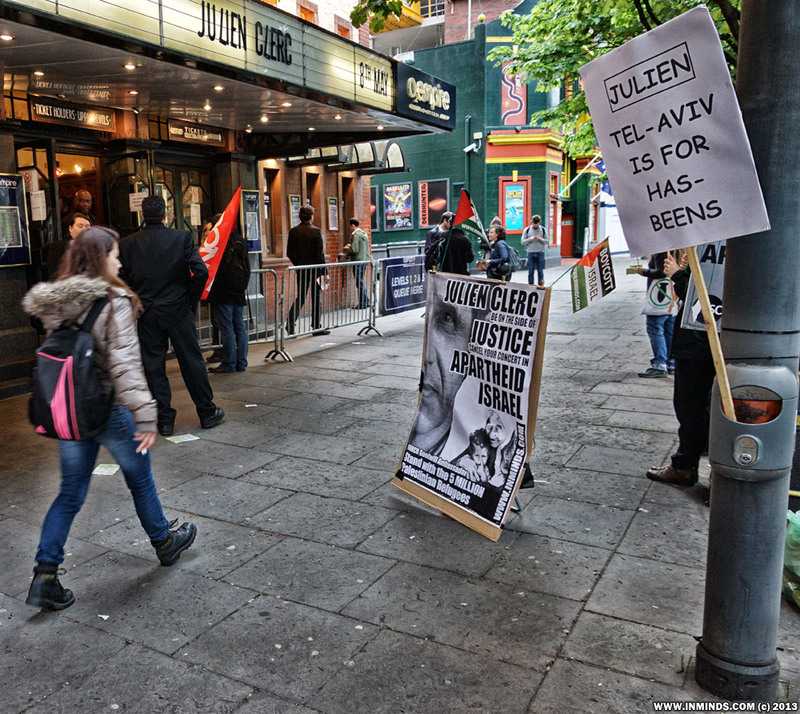 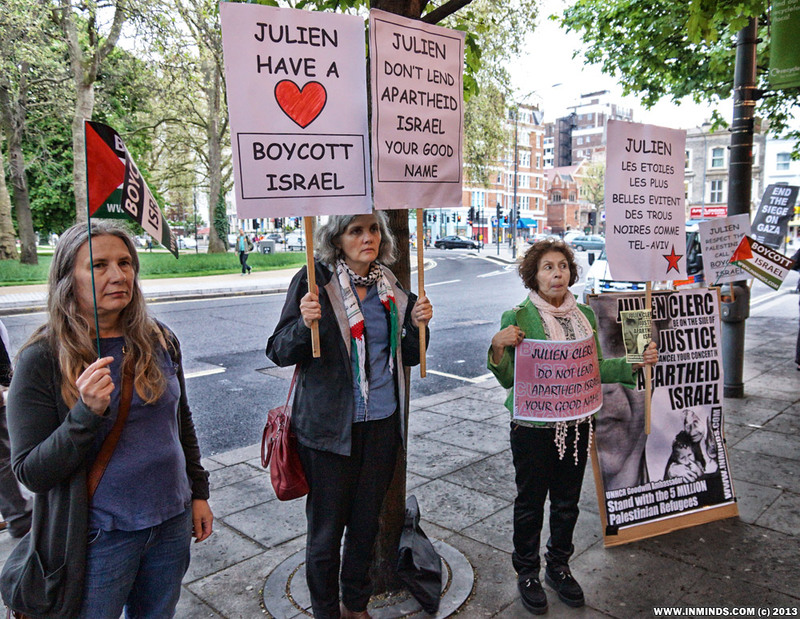 On May 8th 2013 activists picketed the London concert of French singer Julien Clerc, at the Shepherd's Bush O2 Empire, asking him to respect the Palestinian call for artists to boycott Israel and cancel his concert in Tel Aviv scheduled for 7th July. 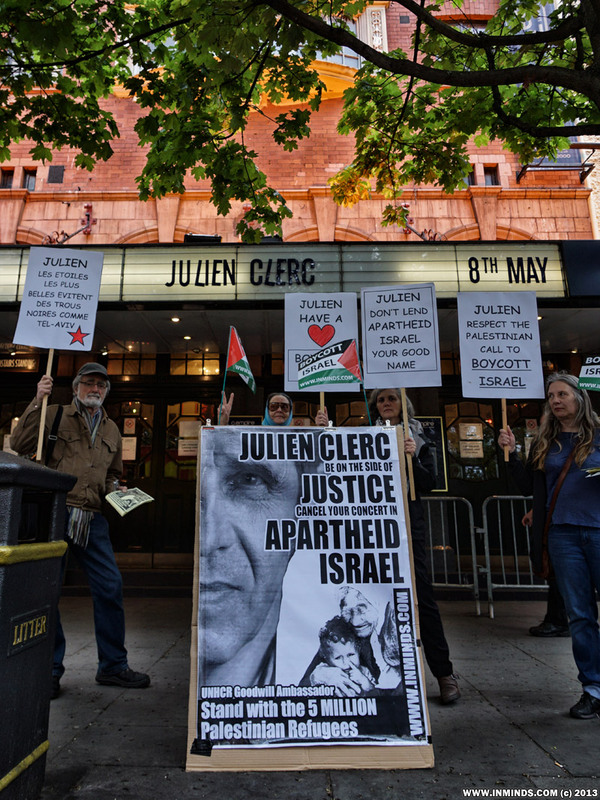 Julien Clerc is known as humanitarian artist who has shown dedication to the cause of refugees and in 2003 was officially appointed as Goodwill Ambassador for the United Nations Refugee Agency (UNHCR). 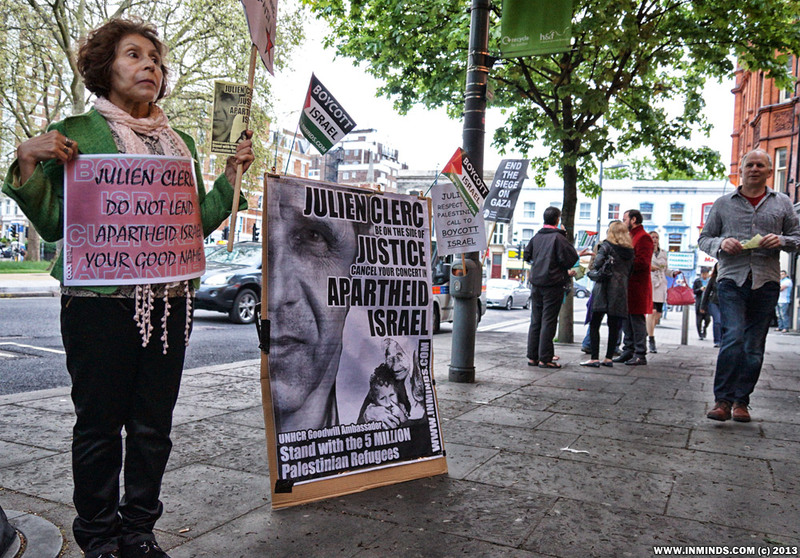 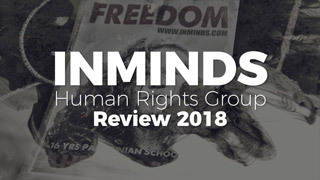 Activists asked Julien Clerc, as Goodwill Ambassador for UN High Commissioner for Refugees, to consider the plight of the longest suffering and largest refugee population in the world - the Palestinians. 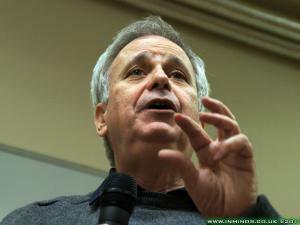 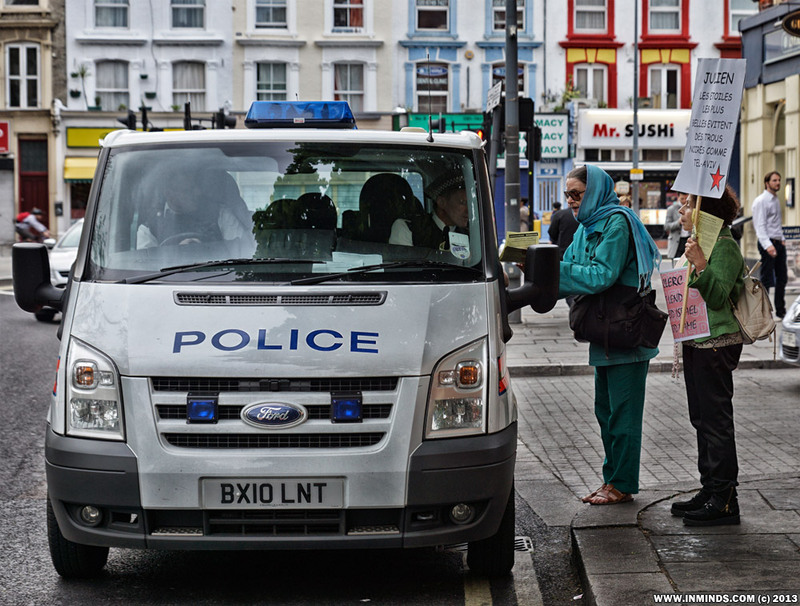 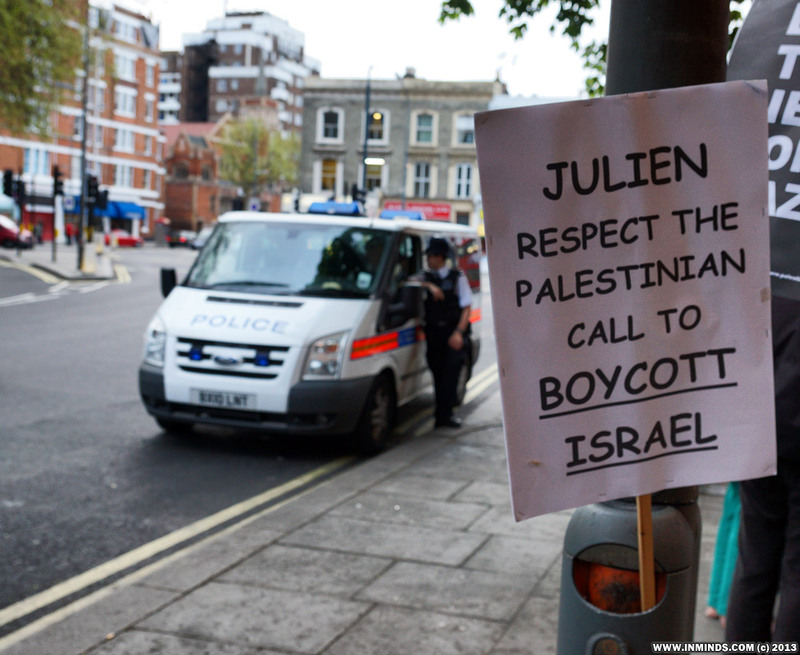 They asked him to stand with the 5 million Palestinian refugees and oppose Israels racist project of ethnic cleansing. 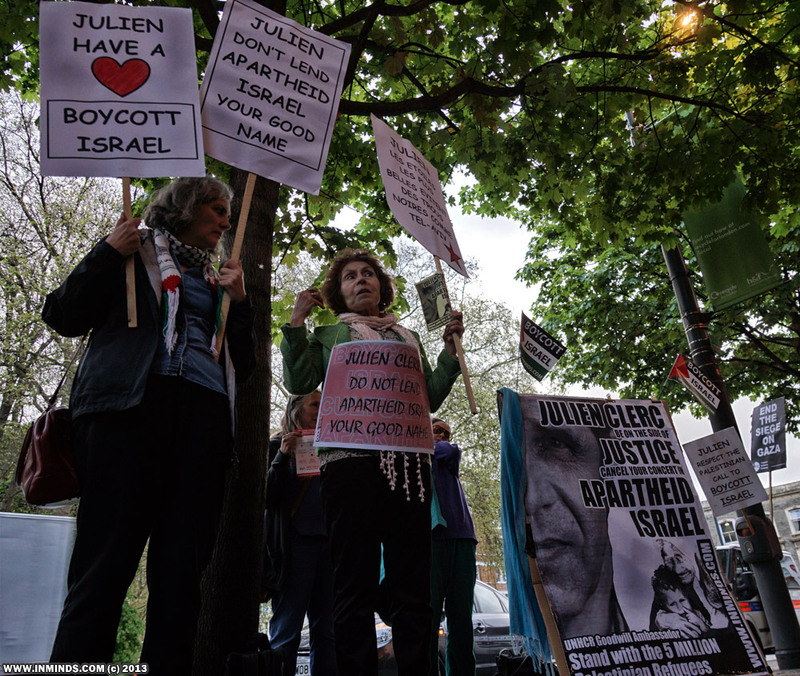 Placards asked Julien Clern not to "lend apartheid Israel your good name" and to "respect the Palestinian call to boycott Israel". 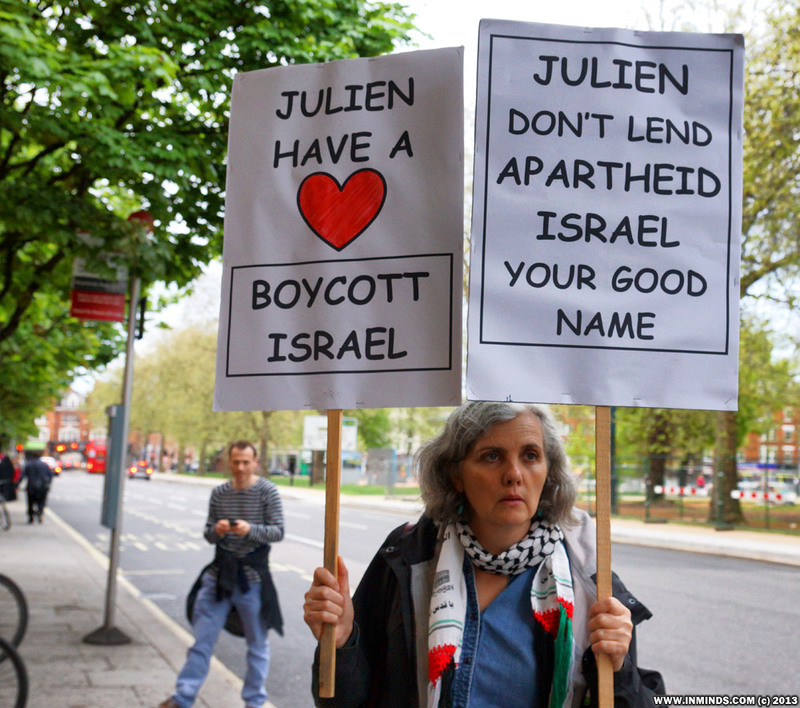 A placard in French alluded to 'bright stars' not performing in the black hole that is Tel-Aviv, others asked "Julien have a heart, boycott Israel". 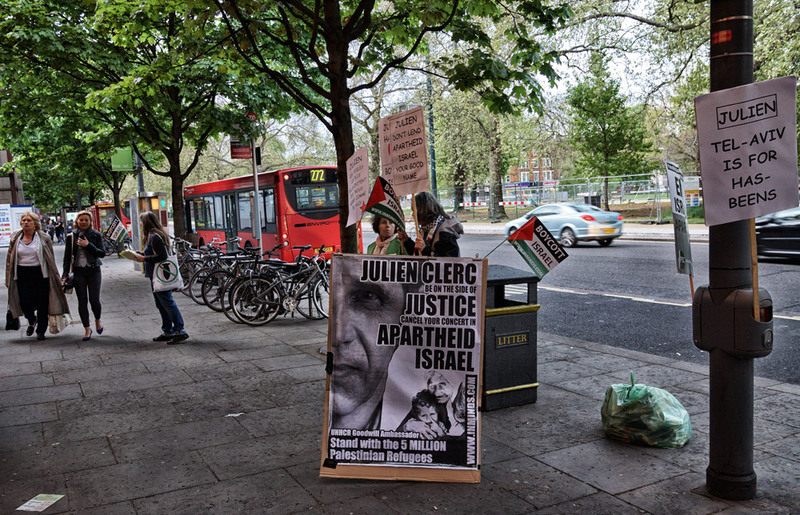 A giant placard read "Julien Clerc be on the side of justice, cancel your concert in apartheid Israel" and "UNHCR Goodwill Ambassador stand with the 5 million Palestinian refugees". 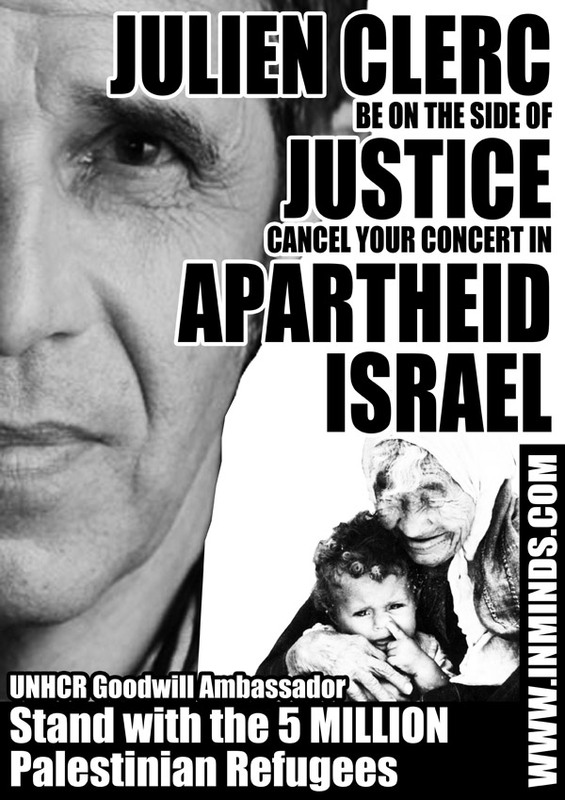 In the name of Justice we call on Julien Clerc to cancel his concert in Tel Aviv on 7th July 2013, and to stand with the Palestinians who have called for a boycott of Israel. 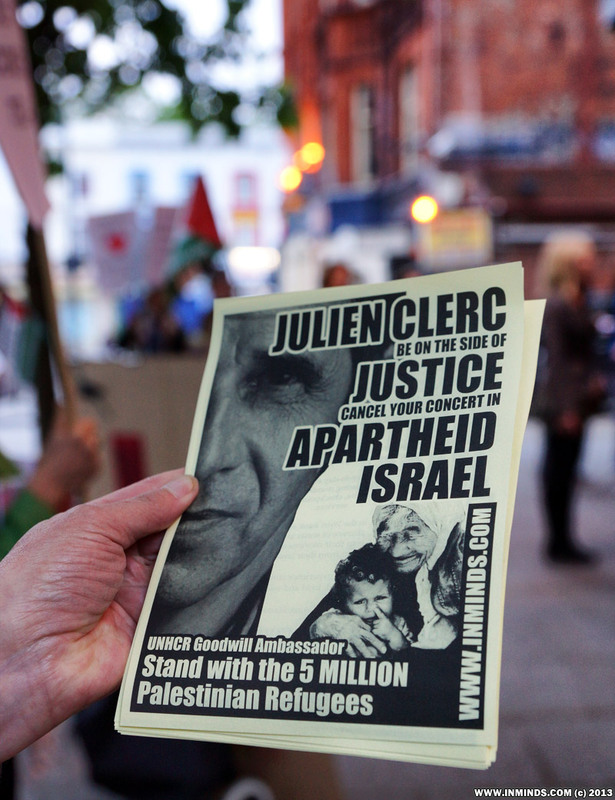 Julien Clerc, as a Goodwill Ambassador for the UN High Commissioner for Refugees, don't ignore the 5 million Palestinian refugees who are denied the Right of Return to their Homeland as established in UN Resolution 194 of December 1948. 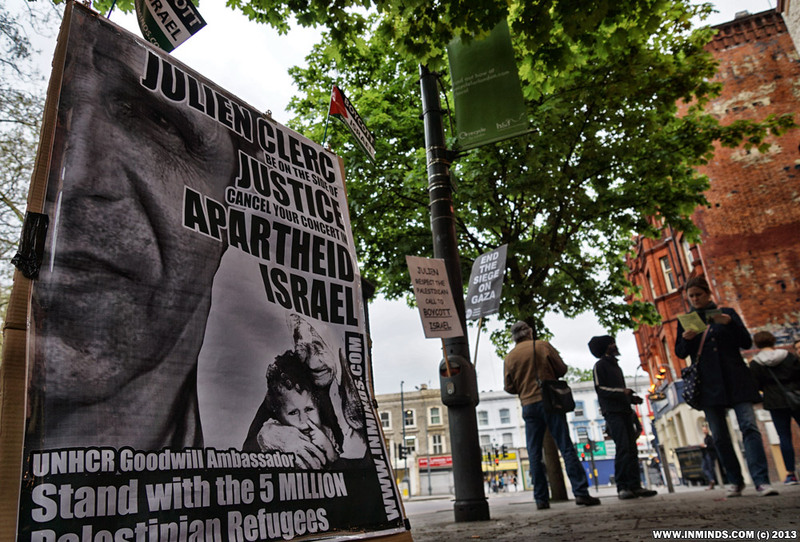 Instead, speak up for the Rights of those uprooted by force and who, after 65 years still living in precarious conditions in refugee camps around the Middle East. 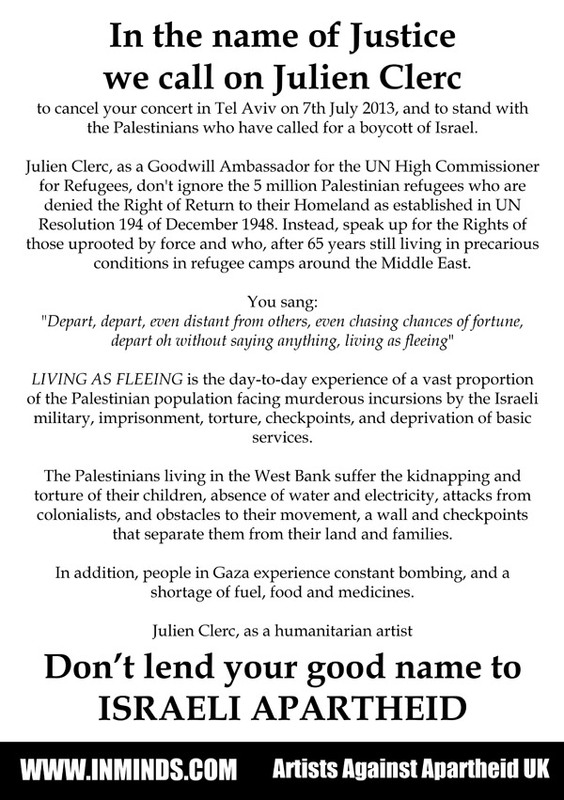 You sang: "Depart, depart, even distant from others, even chasing chances of fortune, depart oh without saying anything, living as fleeing"
LIVING AS FLEEING is the day-to-day experience of a vast proportion of the Palestinian population facing murderous incursions by the Israeli military, imprisonment, torture, checkpoints, and deprivation of basic services. 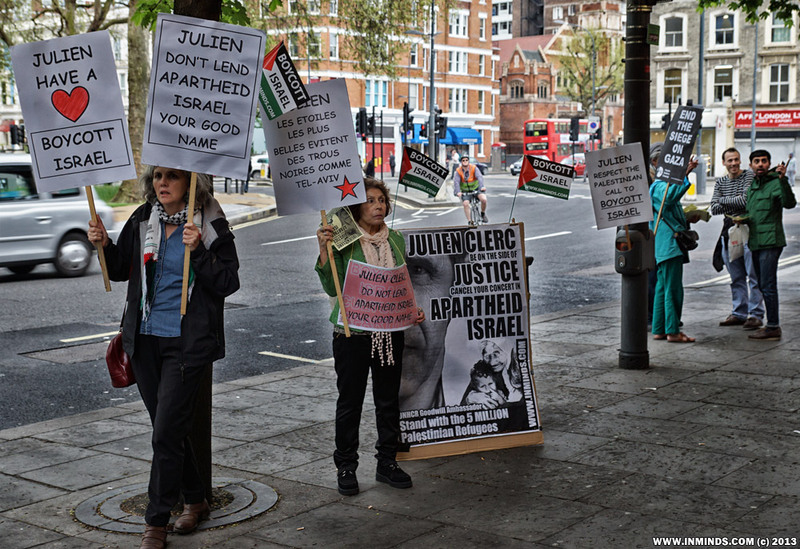 The Palestinians living in the West Bank suffer the kidnapping and torture of their children, absence of water and electricity, attacks from colonialists, and obstacles to their movement, a wall and checkpoints that separate them from their land and families. 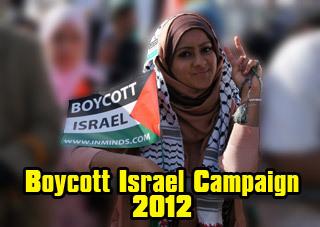 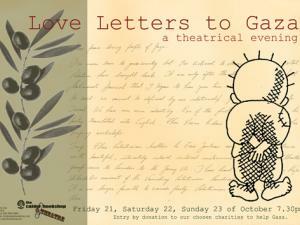 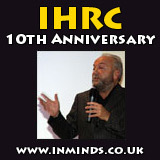 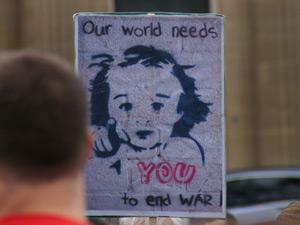 In addition, people in Gaza experience constant bombing, and a shortage of fuel, food and medicines. 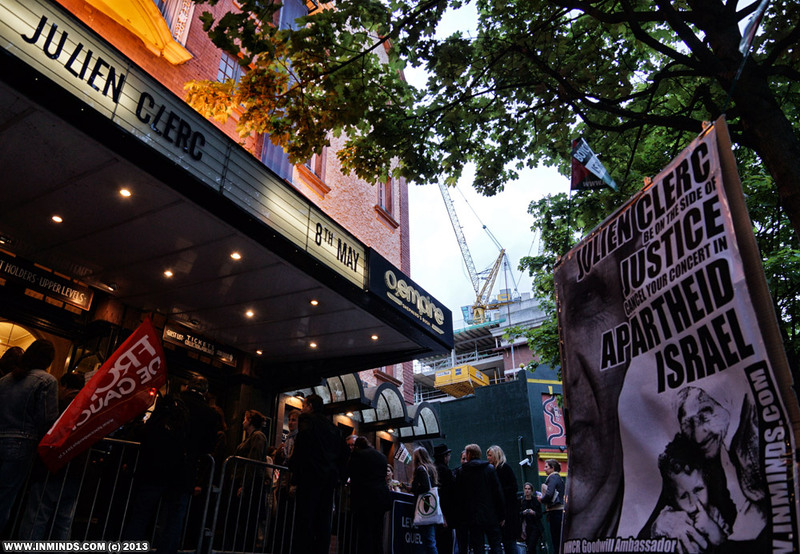 Many fans asked for more details and where happy to listen whilst waiting for the concert to start. 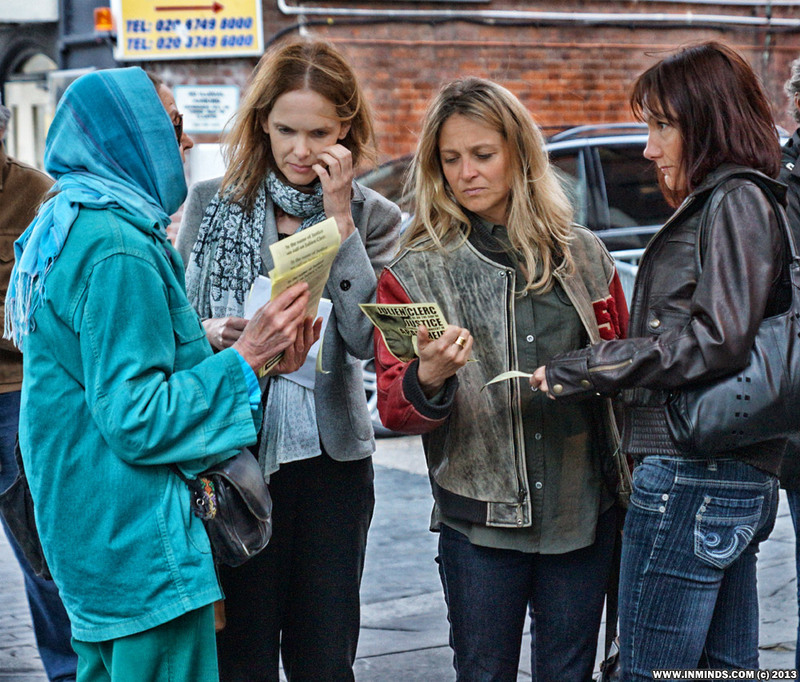 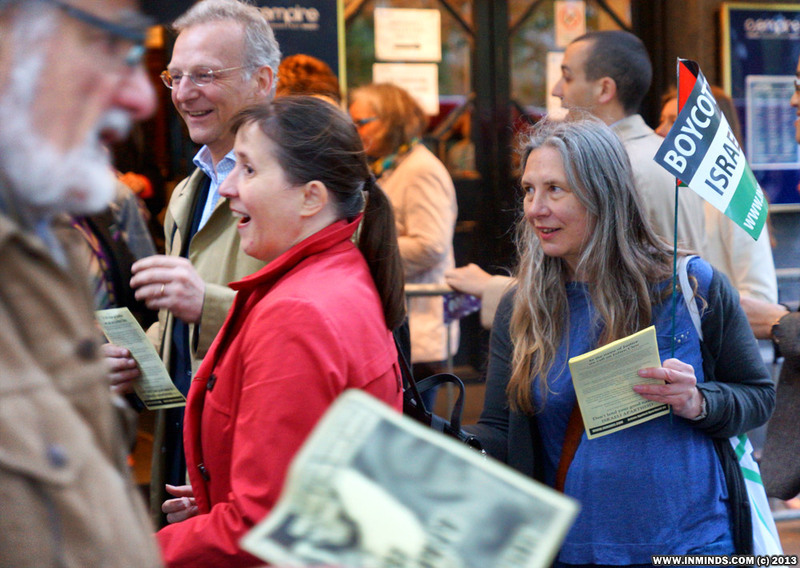 Many of the fans we encountered were most comfortable speaking French, luckily we came prepared with two of the activist having some fluency in French. 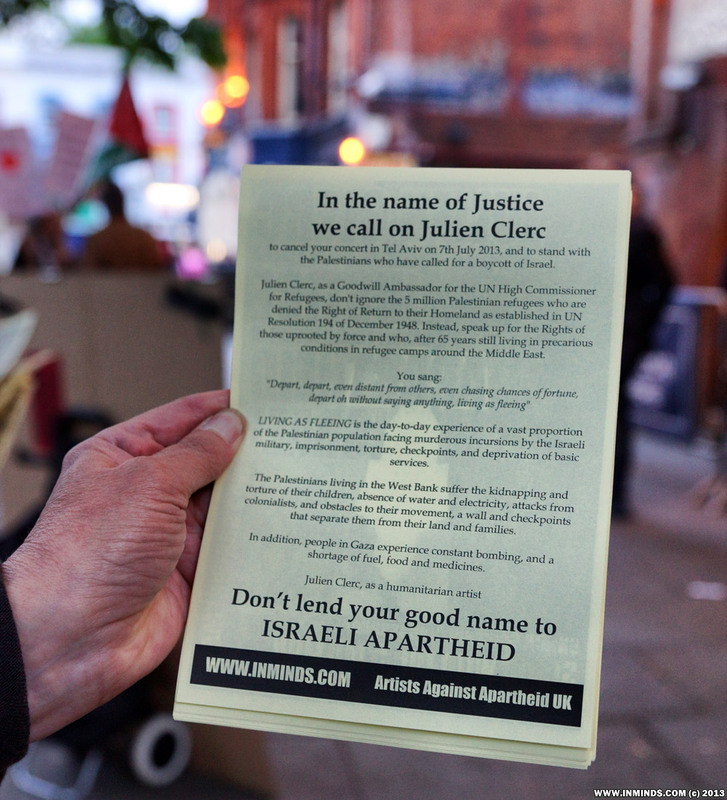 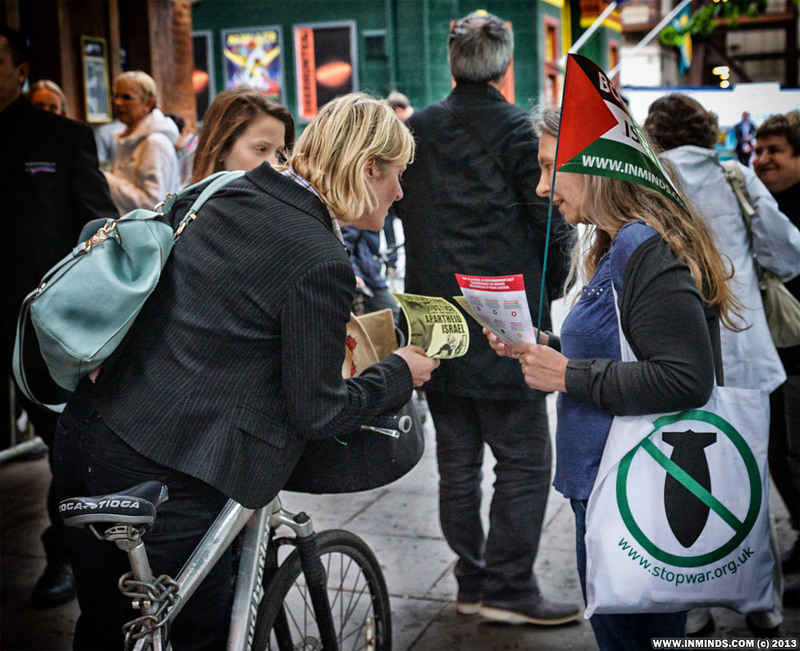 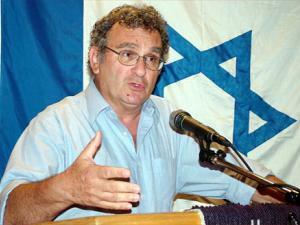 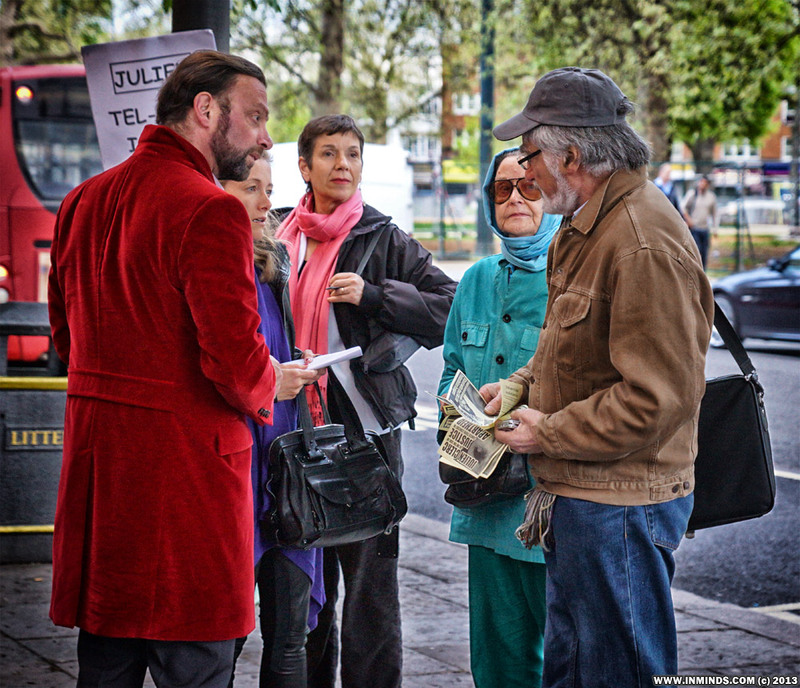 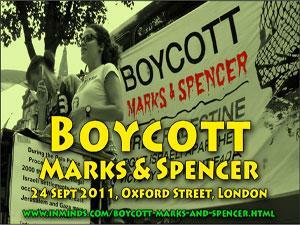 During the leafleting along with many pro-Palestinian songs, Julien Clerc's "Depart" song was played. 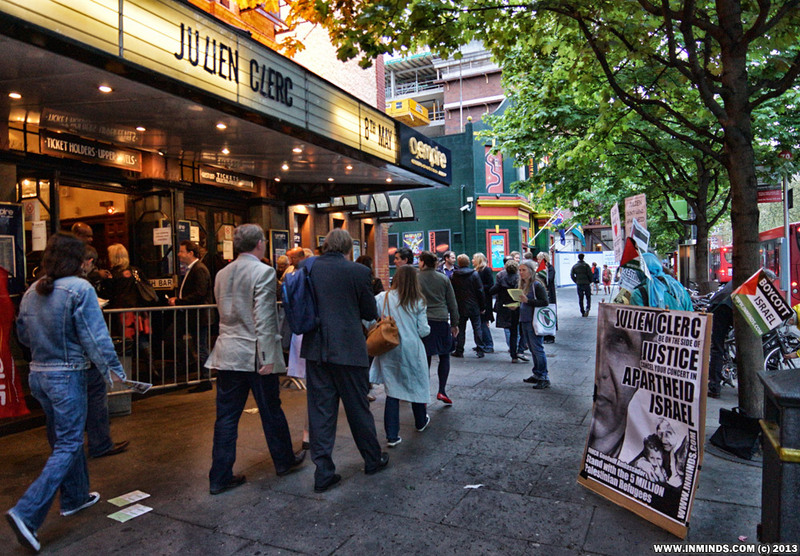 This went down very favourably with the fans queuing outside the concert. 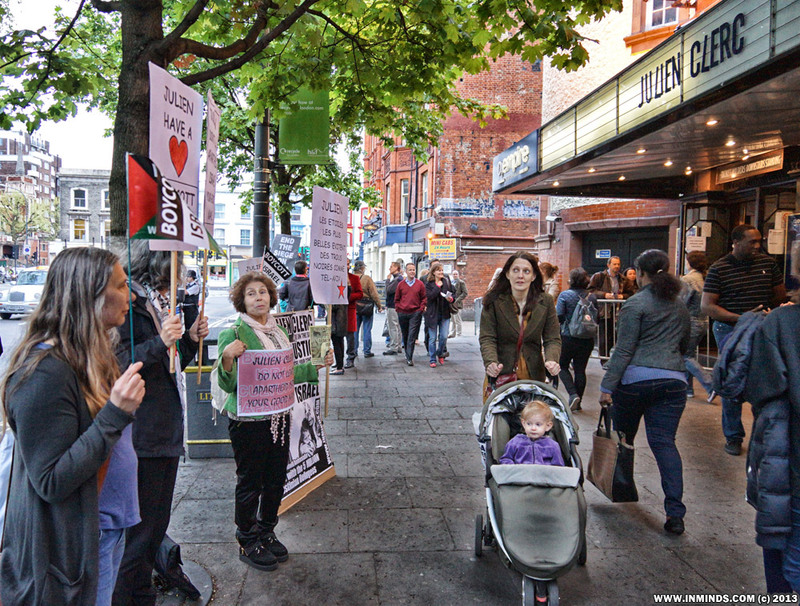 All in all a very successful picket. 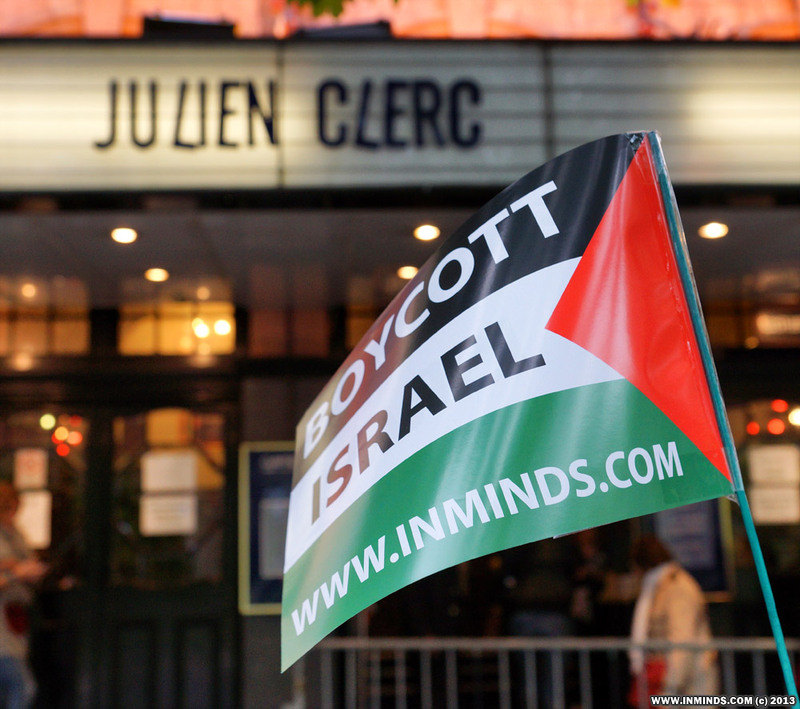 "Yes madame we know about the boycott but who is Julien Clerc?"